Karbon A18 is the first device from Karbonn mobiles to come out with ICS and its quiet some phone. Karbon A18 is priced at 9700 Rs. Sensor - G-sensor, proximity, light, magnetic sensor. The design is pretty straight forward and nice on the face. First thing that your eyes get attracted to is the border, a silver border more like the karbonn smart tab 1. The thickness is more than 12mm. There is a big 4.3 inch IPS LCD displayup front and 4 capacitive hardware button below the screen. On top there is a speaker grill with some sensors on the right and VGA camera on the left of it. The back is made of plastic with a 5MP HD camera on top center with a flash below it and on the bottom back is a big grill that spans from left to right of the device for the speaker, karbonn better have stereo speakers in there. There is power button on the right side and volume rocker on the left. On the other hand design of A100 is monotonous black but with a good rubberized back. A big selling point is the screen. Karbonn A18 has IPS LCD display witha WVGA resolution (480x800). Being IPS it will have very good viewing angles. Size of the screen is 4.3IN and it has slim bezels on the left and right side. Another plus here is good daylight viewing. It is also more sharper then the AMOLED display. This display was present on LG Optimus 2X. It is manufactured by LG. Iphone 4 also uses IPS display, only difference being it is a bit higher in resolution. Micromax A100 on other hand has 854x400 LCD display with 16million colors. Though don't expect high contrast like super AMOLED, but considering the price this display is a real snack. The processor on this device is 1GHz mediatek 6575 which is good, but not the best. It will handle the OS nicely and will give you a smooth performance. It is based on ARM Cortex A9 architecture. The processor is energy efficient and uses 40nm tech. It is a very successful processor as it increases the browsing performance by 35% and graphics performance by 20% compared to its competitors. The processor on A100 is based on the highly successful S1 from qualcomm. Karbonn A18 features a 5MP camera on the back and 1.3MP camera on the front side. This camera is better than one on the A100. It had HD 720P recording capability while micromax A100 has 480P support. The camera is autofocus camera wish some goodies. Face Detection is a nice feature that is a bonus for a device in this price range. This camera feature detects faces. Burst Mode is also present so that you just do not miss the moment. This is top of the line feature. However, i does not record audio from both the mics i.e. not stereo and also the 720P video recording quality is alright. This is 1MP more than the one on A100. The quality will be more sharper and with more detail. Although there is no mention of video calling over carrier. The battery is 1500 mAH. This is good enough for a day usage as you consider the phone's processor is power efficient. You may also get a longer standby time. It has 512 Mb of internal storage. I am not aware yet as to how much is the user available memory. This is average considering 1.32 GB available in Micromax A100. There is a microSD card slot present for upto 32 GB of expansion. Karbonn A18 is a dual sim phone with one 3G sim and other 2G sim. 3G data is 7.2MBPS HSPA.and on 2G Edge is supported. It has WiFi a/b/g/n, GPS and bluetooth v4.0. WiFi n is good to have because it improves the WiFi connectivity. Bluetooth 4.0 is the latest version available and is a good addition to this device. Sensors: This device has a g-sensor, proximity sensor, magnetic sensor and light sensor. It is all packed up nicely. 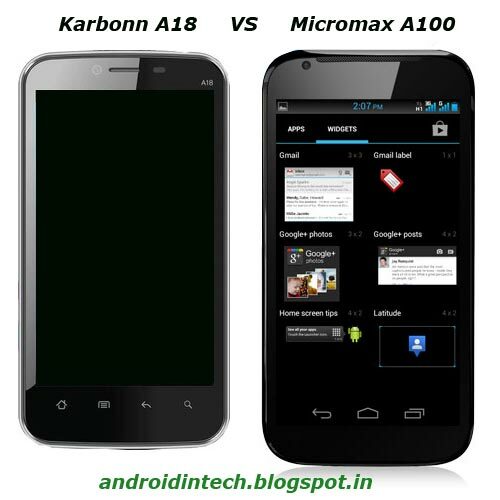 Karbonn A18 supports Android 4.0 ICS out of the box and micromax has not done more of customization to it. You can check full ICS review here. There are some nice pre-installed apps on Karbonn A18. There is a document viewer for quick document viewing purpose. Also there is a document editor which you can use to edit and create document. Is that not good. It also has an app called NextGTv which is live TV App. 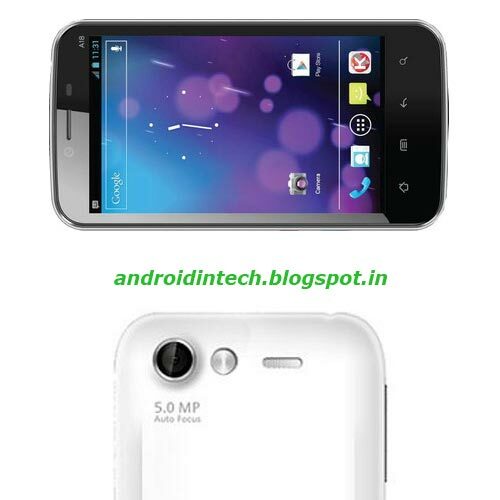 Labels: 4.3 inch, A18, android 4.0, features, Ice Cream Sandwitch, ics, India, IPS LCD, karbonn, Karbonn A18 review, phone price, specifications, video calling.